Through the ages, we’ve extolled the virtues of many famous fathers. We were taught about our founding fathers in history, recently celebrated the birth of the father of our nation, dance to the beat of the father of rock & roll, and wail to the sounds of the godfather of soul. And, of course, depending upon your beliefs, there’s the heavenly father who trumps them all. This month, however, we pay homage to all of the dads who aren’t in the limelight or history books—the men who humbly serve the needs of others sans the fanfare and paparazzi. They are real action heroes—their days filled with the actions of supporting, teaching, lifting, nurturing, mentoring, protecting, feeding, leading, and loving. Here are four dads we think are extraordinary! I didn’t have to travel far to find my first awesome dad. As a matter of fact, I happen to live in a quiet, suburban cul-de-sac with quite a few of them, but David Earle stands out in the crowd as the dad of two fair-haired beauties, Delainey and Nora. I say ‘quiet’ cul-de-sac, but it’s actually anything but since Delainey (4 yo) and Nora (3 yo) hit the scene. David always wanted to be a dad, but had no idea what he was in store for raising girls. He tells me, “I guess what surprised me is how loud they can be. I thought girls would be prim and proper, but their fights rival the ones I had with my twin brother.” David and his wife, Kristen, tried for a while to get pregnant so David said at the point it happened, he was just so happy that gender didn’t matter. “Everyone wants a boy to carry on the name, but I was just thrilled that I was going to finally be a dad.” Delainey’s birth wasn’t without incident, however. She came out with the cord wrapped around her neck and wasn’t breathing. Their precious bundle spent the next seven days in the NICU. Talk about stress. David is one of four children himself (twin + 2 older sisters) so he had an inkling of what he wanted his own family unit to resemble. “I see my role as teaching my girls how to be independent and self-sufficient,” says David. “The big difference for me in raising girls is that I’m probably more aware of the ‘creepy’ people factor. I have to be vigilant because they seem so vulnerable right now.” David credits his own dad (and mom) for providing a strong foundation for the dad he has become. “I always understood I was loved no matter what,” says David. “My job is to love my girls and point them in the right direction, but I’m not gonna lie—I’m a little freaked out about the female issues I’ll have to deal with at some point.” Future boyfriends beware! Like David, Jason Desjardins put fatherhood as a top priority in his life so imagine the disappointment that he and his wife Lisa felt after ten years of trying with no success. 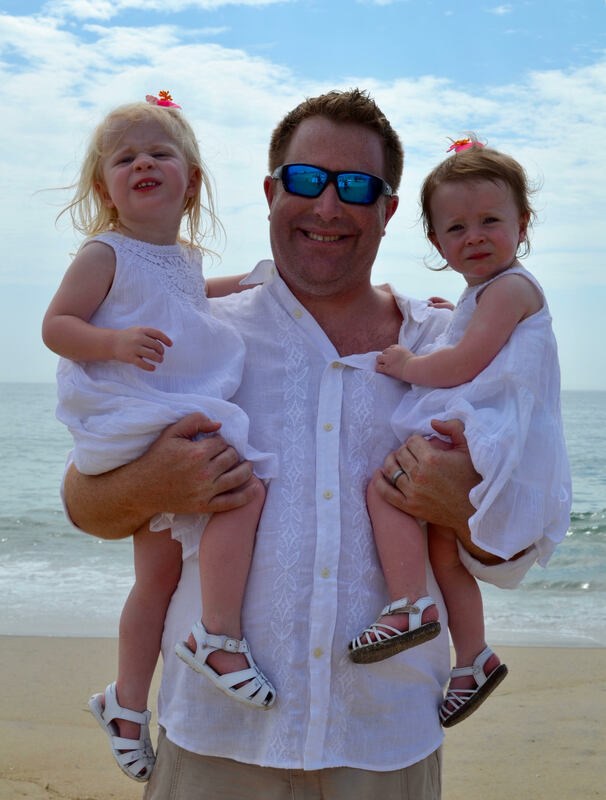 While his path to fatherhood was challenging, it has been no less rewarding. Jason and Lisa welcomed baby Max into their lives through adoption in 2016. Jason’s own childhood was far from perfect so his goal was to provide a child with a loving atmosphere that he never knew existed. “We adopted Max when I was 45. When you’re that age, you’ve seen and done a lot of things so nothing really amazed me anymore. Through Max’s eyes, I now have a new appreciation for life. I look forward to every single day, to discovering the new word, the new song. The world is magical again,” he says. While Jason had imagined that he would be a dad by the age of 30, the longer wait didn’t prepare him for that first year with baby Max. “The first year was rough,” admitted Jason. “He wasn’t sleeping much and there wasn’t much in the way of reciprocating love. It was pretty much feeding, changing diapers, and managing fevers which seemed to occur every other day or so. Thanks to the internet, anything that happens you see as worst case scenario. When Max had a fever and was coughing through the night, one search would lead me to a rabbit’s hole of potential diseases. After that first year, however, things changed. He started communicating and it was a game changer for me.” For Jason, fatherhood has meant a new lifestyle. “You start taking care of someone else first. Then yourself. I totally forget that Max is adopted. He is my son,” says Jason proudly. “Adoption is an extreme challenge in this country. The fact that he is adopted just makes it that much more precious.” And, precious doesn’t even begin to describe Max. Jason and Lisa are looking to adopt a second child in the near future. To learn more about them/their story, go to 3adopt.com. There is no script for fatherhood—or parenthood, for that matter. It comes in many different forms and shows up in many different ways. For those of us who don’t have children of the human variety, our love is channeled to our fur babies. 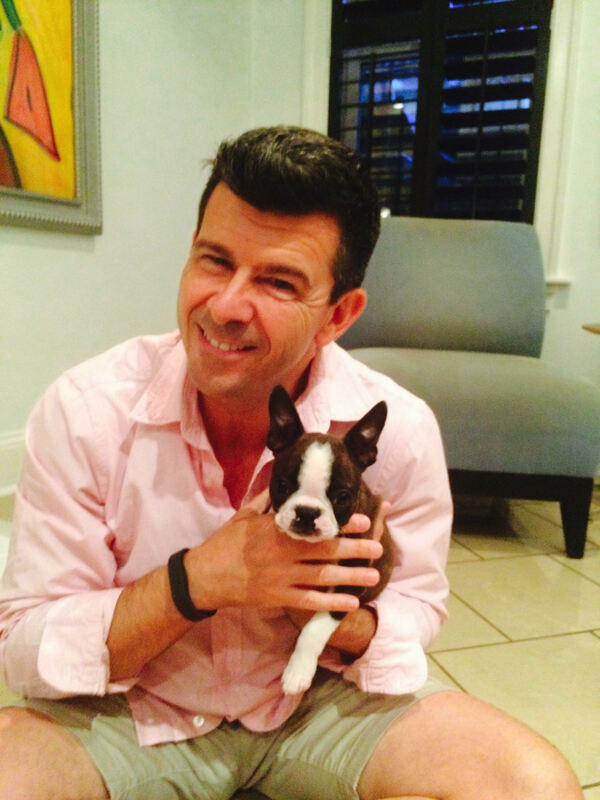 Gio—a very handsome and well cared for Boston Terrier—thinks his dad, Bill Moran, is the greatest ever, and I’d have to agree. As a single dad, Bill does a tremendous job of ensuring all Gio’s needs are met on a daily basis! “Unlike human children, our pets can’t tell us what’s wrong. When Gio isn’t feeling well, I have to be able to recognize what’s wrong and figure it out,” says Bill. 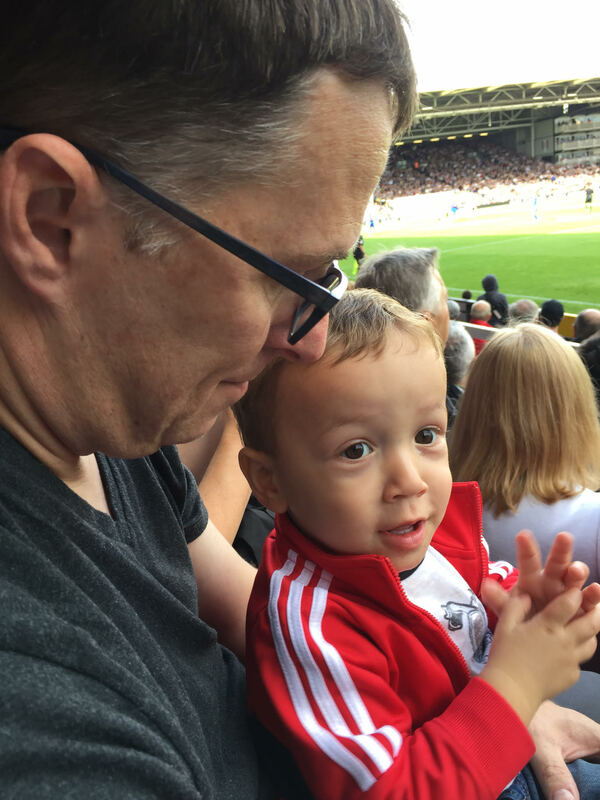 Like any adoptive parent, Bill had to undergo extensive scrutiny before he could take baby Gio home, but it was worth it. “Doesn’t matter if it’s been a crappy day, he’s happy to see me. Dogs don’t care if it’s rainy, sunny or the current economic status. The biggest reward is in the companionship and the unconditional love.” Agreed! For the love of dogs! So many dads, so much love. A special shout out to the foster dads who selflessly shelter and nurture children (fur baby & human) for an interim period. I recently had the pleasure of speaking with Lin Peacock whom, with his wife Claudia, fostered over 200 children before retiring in 2012. Claudia recently wrote and released a book chronicling their experiences called One Big Family (available on Amazon). Sometimes we are blessed with them at birth, but often our biological fathers are unable to rise to the challenge so we search for and find positive male influences in uncles, pastors, neighbors, coaches, teachers, etc. Sometimes we have them for a lifetime, and sometimes only a fleeting moment. We have been known to challenge them, disrespect them, disobey them, disregard them, and maybe, disappoint them. They, however, continue to enrich our lives and love us unconditionally for which we are forever grateful. Let’s hear it for the dads—and the moms who may be playing both roles. You are loved today and in our hearts always.